Hit the Prado Museum right when the doors open to the public. This private tour offers you the possibility of seeing Velazquez’s ‘Las Meninas’ and El Greco’s and ‘The Annunciation’. Learn about the artwork from a guide, and then head to the Reina Sofia to admire abstract and surrealist works by Picasso, Dali and more. This private tour will allow you to get the best experience. With your guide, head inside the museum and stroll around to see some of the best-known treasures and discover the history of the neoclassical building, commissioned by King Charles III in the late 18th century. View master works such as The Garden of Earthly Delights by Hieronymus Bosch, The Annunciation by El Greco and Velazquez’s Las Meninas. Listen as your guide recounts the stories behind each piece, and shares observations about their composition and style. 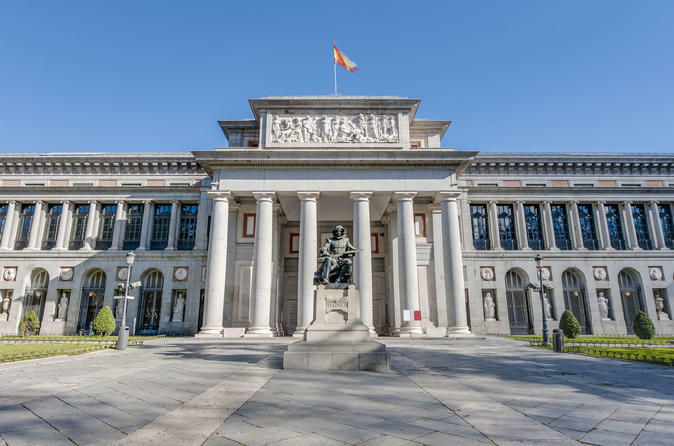 Next, visit the Reina Sofía Museum, another of Madrid’s premier galleries and one that is dedicated to 20th-century Spanish art. Follow your guide through the museum, converted from a hospital building, and view pieces by luminaries such as surrealist Joan Miro and cubist Juan Gris. Marvel at Picasso’s masterpiece of Guernica, and ogle works by surrealist Salvador Dali. Learn about each artist’s life and the abstractions they used to convey meaning. After around four hours in total, your tour will end.